This flavorful ground beef soup is an excellent choice for an everyday fall or winter meal, and it is packed with nutrients. Canned black-eyed peas add protein and make for easy preparation. And it's a hearty, satisfying soup. 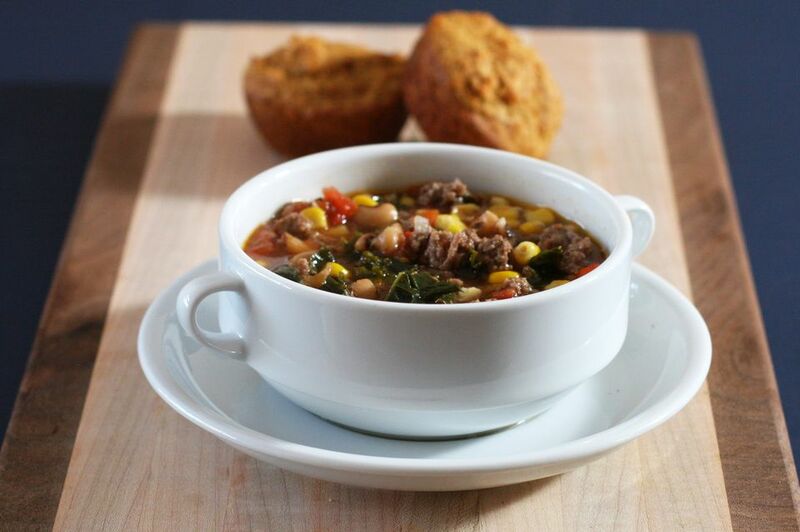 We enjoy this soup with freshly baked cornbread. Biscuits would be good with the soup as well. Add a tossed salad for a fabulous family lunch or dinner. Heat oil in a large saucepan or Dutch oven over medium-low heat. Add the ground beef and onion; saute, stirring, until the ground beef is no longer pink and onions are lightly browned. Add the minced garlic and carrots and cook for 1 minute longer. Add the beef stock or broth and bring to a boil. Simmer for 10 minutes. Add the kale, tomatoes, black-eyed peas, corn, and seasonings. Cover and simmer for 20 to 25 minutes. Serve with hot baked cornbread or corn muffins. Replace the kale with chard, spinach, or escarole. Or use a mixture of greens. Replace the black-eyed peas with black beans or small red beans.